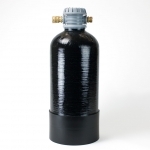 Although it’s less than two feet tall, this water softener is capable of softening hundreds of gallons of water before it needs regeneration. 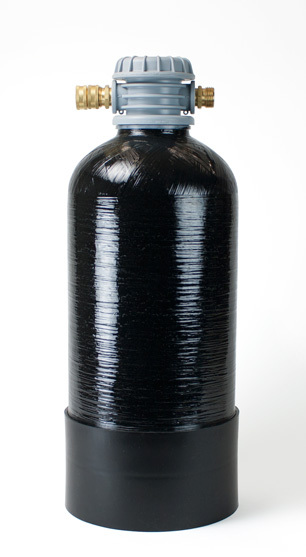 These compact water softeners are designed for daily use, softening all water that enters recreational vehicles and mobile homes, but their portability and ease of use makes them a versatile, high-capacity solution for a wide range of applications such as washing cars, washing windows, rinsing solar panels — any application where hard water causes scale buildup or spotting. A garden hose water softener is very easy to use, requires no installation and no special tools or skills for operation. It connects quickly to any standard garden hose or washer hose, and is regenerated with ordinary table salt. Less than 2 feet tall. Easy to store and easy to move from place to place, even when it’s full of water. 3 gallons per minute; best results at 2 gpm. Works with pressure washers. Regenerates with two pounds of regular table salt. No chemicals required. Regeneration is controlled by a flow restrictor to eliminate guess work. One year warranty on unit, ten year warranty on mineral tank. Instant soft water anywhere there’s a garden hose. No complex setup. No electricity. No connection to drain. Arrives ready to use with any standard garden hose or washer hose. Hardness test kit included to let you know when it’s time to regenerate. No meter, no setup hassles, no counting of gallons, no “sizing” problems. Works on any potable water source. Excellent instructions for setup and service. Made in USA. Replacement parts are readily available. Our cartridge-style garden hose filter menu features filters for reducing chemicals, sediment and for neutralizing the pH of acidic water.